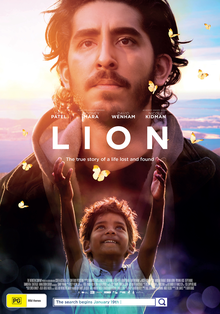 ‘Lion’ is a terrific drama based on a phenomenal real life story, about a young Indian boy who became separated from his family and ended up being adopted by a couple in Australia. That description simplifies the story, but the journey is incredibly compelling and director Garth Davis does an excellent job of bringing the story to the screen in a way that does justice to it. The first part of the film follows 5 year old Saroo (Sunny Pawar) as he grows up in a small village in India with his mother, his brother Guddu and his sister, when he gets separated from his brother at a train station and ends up falling asleep on a train headed in the wrong direction. It’s a scary situation and it’s depicted really well by Davis, who superbly captures the danger of Saroo’s predicament as he attempts to find help, with many of the people he encounters having dubious motives. This part of the film is so engrossing and deeply engaging, and that’s in large part down to Sunny Pawar, who delivers an outstanding child performance. He has to carry many scenes by himself, yet he succeeds with aplomb, and his portrayal is the perfect depiction of a child caught in an alien landscape where he knows no one, and no one wants to know him. I was surprised at how long we spent in India, having seen the trailers and knowing the premise, and I do wonder if this part of the film was expanded when the filmmakers saw how talented Yawar was. The film does lose a bit of momentum when it moves away from India and forward in time, where we join up with the adult Saroo (played by Dev Patel), now a student having been brought up by his adopted parents (Nicole Kidman and David Wenham). Patel plays Saroo’s anguish at his past really well, and Rooney Mara (as his girlfriend) is a good foil for him to bounce off, as he starts to use technology to search for details of his family and his past. It’s not that this part of the film isn’t engrossing, but it lacks the punch of the scenes in India and at times it feels like Davis is dragging the narrative out with an overuse of flashbacks and some choppy editing. Thankfully the film hooks you back in as it moves towards its conclusion, and if you aren’t moved by ‘Lion’, your heart must be made of stone! Dev Patel is excellent throughout the Australian sequences, but I was particularly impressed with Nicole Kidman, who absolutely shines in her small number of scenes. She’s heartbreaking in a key scene with Dev Patel, where Saroo reveals what he’s been searching for, and the work from both actors is masterful. To an extent ‘Lion’ is one of those films that would need to work very hard to fail, based on it’s almost too unbelievable to be true premise, but that shouldn’t diminish the credit it should receives for how it tells the story. I was gripped throughout, emotionally invested in the characters and was completely in thrall to the way the narrative reached a conclusion, and I really loved this film.